If you ever see me and you notice that there's not a book sticking up out of my purse, rest assured that it's an accident and I'm probably going a little bit crazy about it. Anyhoo, the bad thing about carrying books around in one's purse is that the covers of paperback books sometimes get a little mangled. It's very sad. Since I'm currently reading a book ray book that came to me in pristine condition, I decided to try to protect it. Last night I put together a book cover for it and I'm really pleased with how it turned out. I sewed a ribbon into the book cover for a built-in book mark. 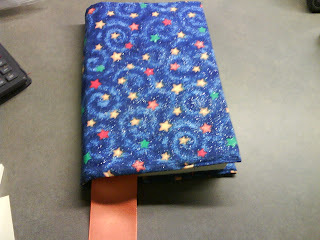 It only took me about 30 minutes to sew it, so I'll probably make a few more for different sizes of books. I might even make a few for my long-abandoned Etsy store. You never can tell. I like this fabric. My sister gave it to me from her stash(free fabric is the best fabric!). You might not be able to tell from the picture, but it's even glittery. Dang! I can't see the pictures at work ;; I guess I'll check it out on Facebook later this evening. I've seen book covers made like this before, and I've been wanting to make one too.